Image courtesy of Library of Congress Had he prevailed in his contested election appeal in 1869, John Willis Menard of Louisiana would have been the first African American to serve in the House of Representatives. On this date John Willis Menard of Louisiana became the first African American to address the U.S. House. With the passage of the 15th Amendment, African Americans first exercised the vote, catapulting hundreds of southern blacks into public office. In November 1868, Menard appeared to have won a special election to succeed the late James Mann, whose district encompassed New Orleans—a victory that would have made him the first African American to serve in Congress. But his opponent, Caleb Hunt (who also had contested Mann’s original election), challenged Menard’s right to be seated. During his brief appeal on the House Floor, Menard recounted the decisive support (64 percent) he had received from New Orleanians: “I would feel myself recreant to do the duty imposed upon me if I did not defend their rights in this floor. . . 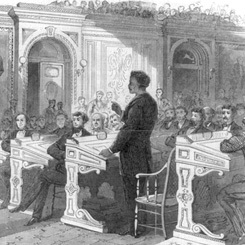 I do not expect nor do I ask that there shall be any favor shown me on account of my race or former condition of that race.” The House deemed neither candidate qualified, leaving the seat vacant for the remainder of the final days of the 40th Congress (1867–1869). In the following Congress, Joseph Rainey of South Carolina won election to become the first African American seated in the House.